The Balkan campaign of Alexander the Great took place in 335 BC, against a number of rebellious vassals of the Macedonian kingdom. Alexander successfully pacified each in turn, leaving him free to begin the long planned invasion of Persia. In 336 BCE, while attending the wedding of his daughter by Olympias, Cleopatra and Olympias' brother, Alexander I of Epirus at Aegae, Philip II was assassinated by the captain of his bodyguard, Pausanias. Philip's son, and previously designated heir, Alexander was proclaimed king by the Macedonian noblemen and army. News of Philip's death roused many states into revolt including Thebes, Athens, Thessaly and the Thracian tribes to the north of Macedon. When news of the revolt reached Alexander he responded quickly. Though his advisors advised him to use diplomacy, Alexander mustered the Macedonian cavalry of 3,000 men and rode south towards Thessaly, Macedon's immediate neighbor to the south. When he found the Thessalian army occupying the pass between Mount Olympus and Mount Ossa, he had the men ride through Mount Ossa and, when the Thessalians awoke, they found Alexander at their rear. The Thessalians surrendered and added their cavalry to Alexander's force as he rode down towards the Peloponnese. Alexander stopped at Thermopylae, where he was recognised as the leader of the Sacred League before heading south to Corinth. Athens sued for peace and Alexander received the envoy and pardoned anyone involved with the uprising. At Corinth, he was given the title 'Hegemon' of the Greek forces against the Persians. While at Corinth, he heard the news of the Thracian rising to the north. Before crossing to Asia, Alexander wanted to safeguard his northern borders and, in the spring of 335 BC, he advanced into Thrace to deal with the revolt, which was led by the Illyrians and Triballi. He was reinforced along the way by the Agriani, a Thracian tribe under the command of Alexander's friend, Langarus. The Macedonian army marched up to Mount Haemus, where they met a Thracian garrison manning the heights. The Thracians had constructed a palisade of carts, which they intended to throw upon the approaching Macedonians. Alexander ordered his heavy infantry to march in loose formation and, when the carts were thrown, to either open the ranks or lay flat on the ground with their shields over them. The Macedonian archers shot and when the Macedonian heavy infantry reached the top of the mountain they routed the Thracians. Meanwhile, a large Triballian army led by their king, Syrmus, advanced upon the Macedonian rear. The Triballians retreated to a gorge, where they were drawn out by Alexander's light infantry. On the open ground, they were crushed by Alexander's infantry and cavalry, leaving behind 3,000 dead. The West Thracian Triballian king Syrmus took refuge to Peuce Island in the Danube Delta when pursued by Alexander the Great. Alexander brought ships up the Danube to use in an assault on the island. The attempts failed due to the swift current of the river, steep banks, and fierce defense. Eventually the Macedonians abandoned their attacks on Peuce and instead crossed into the territory of the Getae. The Macedonians marched to the Danube River where they encountered the Getae tribe on the opposite shore. As Alexander's ships failed to enter the river, Alexander's army made rafts out of their leather tents. A force of 4,000 infantry and 1,500 cavalry crossed the river, to the amazement of the Getae army of 14,000 men. The Getae army retreated after the first cavalry skirmish, leaving their town to the Macedonian army. The Siege of Pelium was undertaken by Alexander the Great against the Illyrian tribes of what is modern day Albania. It was critical for Alexander to take this pass as it provided easy access to Illyria and Macedonia, which was urgently needed in order to quell the unrest in Greece at this time in Athens and Thebes. This was an important point of demarcation in Alexander's early reign, as it established him among the Danubian tribes to the north as a serious monarch to be reckoned with, just as he would later establish this precedent for the Greek city states under his hegemony. Taking this place allowed Alexander to march his army to southern Greece quickly, which would eventually result in the total destruction of Thebes. The Battle of Thebes was a battle that took place between Alexander III of Macedon and the Greek city state of Thebes in 335 BC immediately outside of and in the city proper. After having been made Hegemon of the League of Corinth, Alexander had marched to the north to deal with revolts in Illyria and Thrace. The garrison in Macedonia was weakened and Thebes declared its independence. The Thebans refused to submit on merciful terms, and he assaulted the city, took it, and sold all the survivors into slavery. With the destruction of Thebes, mainland Greece again acquiesced in Alexander's rule. Alexander was now finally free to undertake the Persian campaign which had been planned for so long by his father. ^ McCarty, Alexander the Great, p. 30-31. ^ McCarty, Alexander the Great, p. 31. ^ Bose, Alexander the Great's Art of Strategy, p. 96. ^ Arrian, The Campaigns of Alexander, p. 44. ^ Arrian, The Campaigns of Alexander, p. 45-48. Renault, Mary, (2001). The Nature of Alexander the Great. ISBN 0-14-139076-X. Lane Fox, Robin (1973). Alexander the Great. Allen Lane. ISBN 0-86007-707-1. Lane Fox, Robin (1980). The Search for Alexander. Little Brown & Co. Boston. ISBN 0-316-29108-0. N. G. L. Hammond; Frank William Walbank (2001). A History of Macedonia: 336-167 B.C., volume III. Oxford: Clarendon Press. ISBN 0-19-814815-1. James R. Ashley (1998). 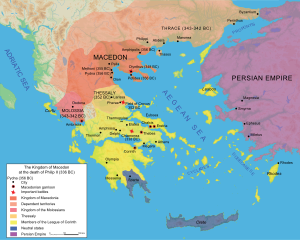 The Macedonian Empire: The Era of Warfare Under Philip II and Alexander the Great, 359-323 B.C. Jefferson, North Carolina, London: McFarland and Company Inc. ISBN 0-7864-1918-0. Arrian (1976) [140s AD]. The Campaigns of Alexander. trans. Aubrey de Sélincourt. Penguin Books. ISBN 0-14-044253-7. Bose, Partha. (2003). Alexander the Great's Art of Strategy. Allen & Unwin. ISBN 1-74114-113-3.